Alliances are fickle things. They get broken all too easily. Suddenly, the team you trusted in your fight against an enemy has allied with your enemy and is ripping through your weakened borders, spelling the end of your team. Other times, you are the one to turn on an ally. You can see them getting too strong, too powerful, so you ally with weaker teams so you can be the strongest. We all know how it goes. I, however, have lived to see an alliance never truly broken. An alliance so perfectly cohesive, it was shocking. 10pm rolled by, and the Russian Writers lightning game began. We chose the south. Red chose our northern border and up. Green claimed the northern most part of Florida. Purple ended up on the east coast, trying hard to make up for their under-sized team. Blue seemed a bit confused on where to go and never really managed to get good footing. It took a few turns to get situated, just like most games, especially lightning, but by about turn 7 or 8, we had worked out decent borders. Sara West and I, commanders of red and orange respectively, agreed upon an alliance before the game even begun, as fighting four other teams at once is never a great idea, and purple asked for some help, being the underdog, so our three teams allied together against blue and green. The orange team was pretty much good to go, nice and cozy in our southern lands with red and purple between us and any enemies. Meanwhile, blue and green irritated the heck out of our allies. Within a few turns both asked for some help with our enemies, as would be expected of their ally. We could have stayed back while our allies were being attacked or even taken advantage of the weak borders we shared, but we didn't. Were the situation reversed, we trusted that our allies would aid us against our enemies and not destroy us. Plus, it would be fun to rip through an enemy, and we'd get more territory, the key to winning. 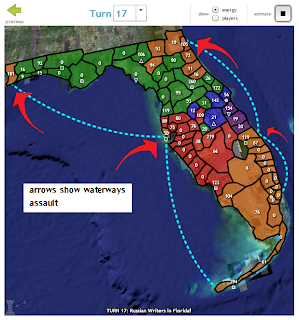 Using the waterways, we managed to send large numbers of troops at green from both sides of Florida. By turn 18, we split their empire of 30 connected territories in pieces, the largest only 9 territories. That was only possible, of course, because red and purple, our loyal allies, were protecting our other borders and fighting green's southern front. Through our combined effort, blue, green, nor any other enemy that we could have had, stood a chance of winning. All too soon though, green was forced to shield, blue already long gone, and our three teams were left with no one to fight but our own loyal allies. We merely swapped while green had their shield up, dreading when we would have to turn on our own allies. Finally, however, the time came, and we all agreed that we shared the victory and that we would fight out the last few turns of the game just for our own enjoyment. My team barely won, by only one territory over red, but it didn't matter. No matter who had the most territories at the end, each of us knew that it was only possible because of the other two teams. Had purple and red not stood between us and enemies to start the game, we wouldn't have had enough energy to wipe out green. Had we not fought to save our allies, they would not have survived, and my team may have been overpowered by green coming at us. Had red and purple fought each other as they likely would had, were it not for their common allegiance with the orange team, both would have been crippled, in turn leaving my team less chance to survive. But by sticking with each other as loyally as we did, we ensured that we would be the top three teams and proved that loyalty and trust wins wars, not backstabbing and lies. I like that there was no backstabbing...except someone still won (which means someone rolled over for the other then). Also, that's smart, sending large amounts of forces up using the waterways, surprising people. I remember when you did that a few days before this game. Oh yah, that was against an enemy. And it's what won you the game. And it was against an Ally. And you really had nothing to do with it, cautioning against it. So really what we can get out of this is "using the waterways and attacking exposed land from the back can win" moreso than "alliances rock"
So Emma, do you ever write about anything besides how incredible you think you are? I write about bananas too. Write about it! =D Then send it in to Emmanuel!